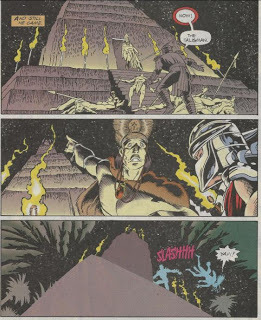 At a temple in the heart of a lost jungle, the Shredder stands before a pile of his own dead Foot Soldiers, slain by an army of tribal warriors. Shredder orders the tribal chieftain to hand over the Green Talisman, but the chieftain sends his warriors to kill the Shredder, instead. The Shredder fights his way through the warriors, eventually killing them all and the chieftain as well. He then scales the temple and snags the Green Talisman (which looks like a third of a Zodiac calendar). In New York City, Raph is busy pummeling punks, trying to dig up information the Green Talisman of the Thirteenth House, but none of the scumbags know what he’s talking about. Raph returns to the sewer lair empty handed, though Splinter tells him not to feel too dejected. Few know of the 13th sign of the Zodiac, the Turtle, whose year comes only once in a millennium (this happens to be that year). The other Turtles are busy digging up info on the Talismans in their own fashion (at Splinter's behest, as the stars are aligning and time is short). Don searches the net, but comes up with nothing. Leonardo strikes gold in an old parchment, learning that one of the Talisman’s is in Tibet. Mikey, while goofing off and watching a TV ad for the “Mighty Mecha Power Raiders” stage show at the Radio City Music Hall, notices that the White Raider is using one of the Talisman’s for a belt buckle! The Turtles race off to Radio City, though Don quickly updates his friends on the net with their latest find. Unfortunately, one of those “friends” is Cyberius, a hacker working for the Shredder. Cyberius traces the modem (that Don stupidly left on in his haste) and finds the whereabouts of the Turtles’ secret lair. Shredder dispatches his henchmen (Cyberius, T.K.O. and Psonic) to Radio City to intercept the Talisman, while he heads to the Turtles’ lair alone. At Radio City, April O’Neil and Oyuki are covering the Power Raiders’ stage show when the Turtles come barging through the crowd. Leo demands that Timmy the White Raider hand over the Talisman, but he refuses. 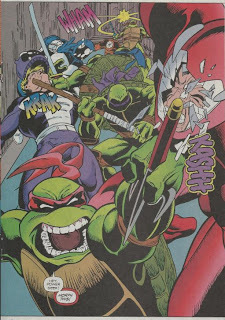 The Turtles beat the stuffing out of the Power Raiders with ease, mocking their lack of martial arts skill. The White Raider, however, succeeds in summoning the mystical energies within the Talisman and begins pummeling the Turtles all on his own. Meanwhile, the Shredder infiltrates the lair and attacks Splinter. Splinter puts up a good fight, but the Talisman has made the Shredder too powerful. Channeling the mystical energy into his gauntlet, he stabs Splinter through the chest. Before finishing his old foe off, Shredder is distracted by the sight of the parchment. Reading it, he learns the location of the third and final Talisman. When Shredder looks back, though, Splinter has vanished. Shredder mocks his enemy for hiding and vows that, once he has all three Talismans, he will use their immense power to conquer the world. At Radio City, the White Raider proves too much for Leo, the only Turtle left standing. Using his wits, Leo slices off the White Raider’s belt, separating him from the Talisman (and hsi pants). While Leo is busy knocking the simpering Power Raider out, however, T.K.O. succeeds in covertly using her telekinetic powers to levitate the talisman into her hands. The three henchmen then disappear, leaving the Turtles to wonder where the Talisman went. Having failed their mission (and pissed off a lot of Power Raiders fans), the Turtles return to their lair, only to find the place trashed. Their immediate concern is for Splinter, but he steps out of the shadows, none the worse for wear. As a matter of fact, he feels better than ever: The mystical energies of the Talisman have returned him back to his human form as Hamato Yoshi! Epilogue: The father tells his son that it’s getting late and he’ll have to hear the rest of the story another night. The child wishes his dad good night and as the father steps over to the lamp to turn it off, the light reveals him to be Hamato Yoshi (whom the child addresses as “Splinter”). *This story is continued from the framing device in TMNT Adventures #72. The story continues in The Year of the Turtle #2. *Shredder last appeared in TMNT Adventures #44. Exactly how he returned from the future, or if this is even the same Shredder or the one from the present, is never addressed. *This is the first time in the series the Shredder has ever been shown utilizing human Foot Soldiers (beyond a brief flashback in TMNT Adventures miniseries #1). *The Turtles’ lair is modeled after their subway station digs from the live action film series and “Next Mutation” TV show. *The Turtles are portrayed as being public figures in this story. 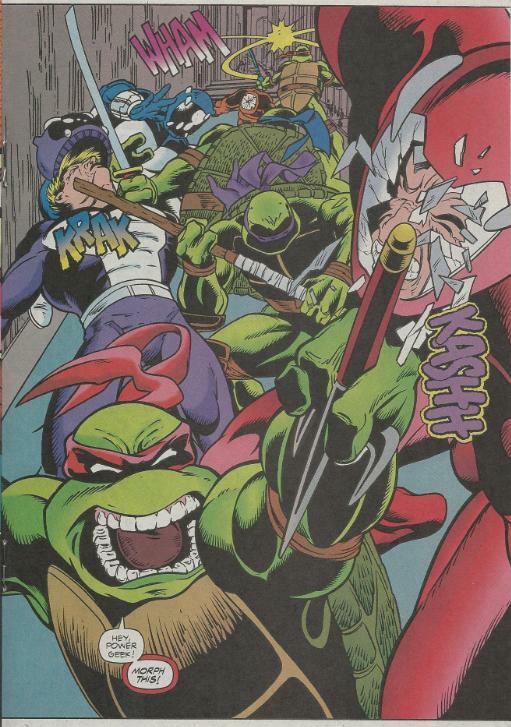 Their existence was revealed to the world in TMNT Adventures #59. 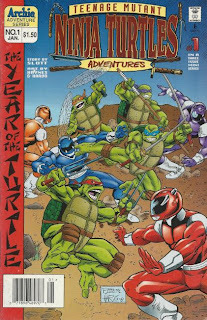 *Solicitations in TMNT Adventures #72 advertised this issue as being released in October, 1995. Apparently, it met with delays. Well, if you’re both a Slott fan and a TMNT fan, then I think you’d do well to pick up The Year of the Turtle miniseries, as it really is an excellent finale to TMNT Adventures. And that’s kind of odd, considering it was solicited as “a new direction” in earlier advertisements, despite functioning as a pretty concrete ending for the series. The “new direction” of the miniseries is mostly reflected in how it separates itself from TMNT Adventures by a couple of degrees. There’s a clear intent to make the tone more consistent with the live action film series and the original Mirage comics, as the Shredder now leads an army of human Foot Soldiers rather than robots and the Turtles’ lair is the subway station from the second film. The disconnect isn’t as off-putting as you might think, as Slott takes pains to still connect Year of the Turtle with the previous continuity. 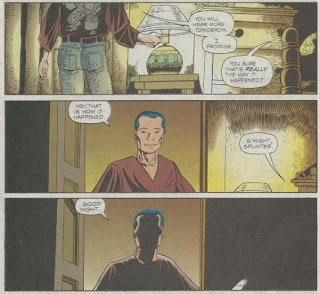 Oyuki makes a silent cameo (with a new punk haircut) and the fact that the general public is aware of the Turtles’ existence is a clear nod to the “Blind Sight” arc. As for the human Foot Soldiers, well, it’s been a while since we last saw the Shredder. I kind of got the impression that he spent that extended absence rebuilding the Foot Clan with human grunts (exactly how he got back from the future is anybody’s guess). Slott was still somewhat new to the comics writing game and some of that reality bleeds through into this story. The jab at “Mighty Morphin’ Power Rangers” is groan-worthy at best and dates the ever-loving HELL out of this comic. In case you weren’t around in the 90s, “Power Rangers” was hailed as the kid’s merchandising franchise that dethroned the Ninja Turtles and ushered the brand into oblivion. Slott is clearly trying to take a swing at the show and it’s all just a little embarrassing. Incidentally, I wrote an article not too long ago about an episode of “The Real Ghostbusters” that did exactly the same thing with Ninja Turtles (TMNT having been the newcomer that dethroned the Ghostbusters). The overall tone of Year of the Turtle is perhaps a little “superhero-y”, with Shredder’s super villain henchmen being the worst offenders, but it’s definitely something fresh and a welcomed diversion from the soap opera TMNT Adventures had become in its declining years. The amount of violence is certainly baffling, as that was exactly why Gorelick and Goldwater gave Steve Murphy the axe from the ongoing series; yet here the book practically opens with a mountain of corpses. I guess since there’s no blood, it’s all good. Penciler Hugh Haynes is dynamite and he really goes balls to the wall with this story. His style is perhaps a little too grim for this kind of tale and doesn’t often reflect the levity in Slott’s script, but his layouts and action sequences are stellar. His flow of movement is really fluid; I'd like to point to the scene where all four Turtles launch themselves onto the sign above Radio City and just how ellectric that looks (particularly Don’s pole-vaulting). A few bandana errors aside, Philip Lynch’s coloring is great; far more lavish than Barry Grossman’s competent if not-so-ambitious coloring in TMNT Adventures. Year of the Turtle is a pretty darn good miniseries and a solid ending to the series, if I do say so, myself. Some fans turn their noses up at it because “It isn’t the Forever War”, but I think if you give it a fair shake you’ll find it closes the book rather nicely. The random assimilation of elements from other TMNT franchises is definitely a little bizarre, but the overall narrative works wonderfully. A part of me almost *doesn’t* want “The Forever War” to be published if it means overwriting Year of the Turtle. But that’s a knee-jerky attitude; forgive me. I especially love that page where Raphael is going all Batman-esque interrogating that thug. 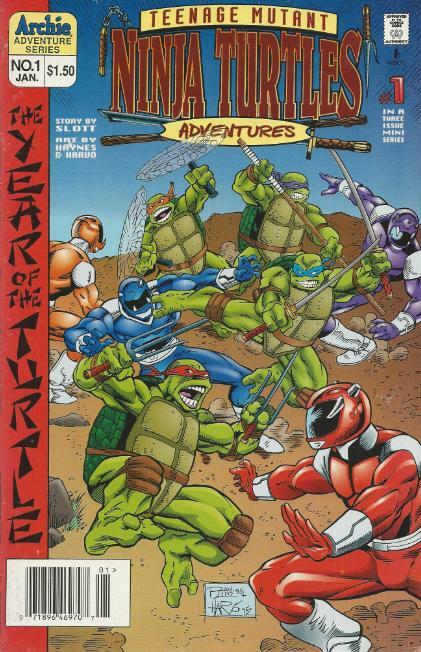 I had forgotten that this mini-series was actually advertised in the pages of TMNT Adventures. I'd be interested to know if Archie had any cooperation Mirage Studios in getting this new team together. It seems like they were trying to push Murphy and the Mirage guys out of the picture near the end, and maybe that J.D.Vollman ruse was Murphy's last attempt at pulling the wool over their eyes. As a kid I hated Power Rangers so reading this as a 10 year old made me laugh. Almost seemed like the Turtles were getting "revenge" on the Power Rangers for stealing their popularity. As a fan of both the Power Rangers and Ninja Turtles, I don't like one side more than the other. In other words, they're equally likeable to me.